Its already been established in many reviews that the Sawyer Squeeze Mini is the lightest, cheapest, most vestal way to filter water in the backcountry. But, its versatility can really make people frustrated. People always seem to be fumbling around with it never using it to the maximum potential. I’m going to show you the way I’ve set up my Sawyer Squeeze Mini to work the most efficiently for me. To start things off here are the requirements I have for filtering water. I always carry a hydration bladder. Its my main method of consuming water while hiking and how I store water while in camp. Therefore, making the Sawyer Squeeze Mini work seamlessly with a hydration bladder was a big priority for me. One of the downsides to a hydration bladder is that you need to almost unpack your bag to refill it – I wanted to change this. I also needed a way to filter a lot of water at camp. This means I can filter water for a group at once and not need to go get water all the time. I cut the drink tube on the Hoser about 8 inches from the bite valve and connected the HydroLink Filter Adapter’s female end (the one with the on/off switch) into section of drink tube that connects to the Hoser. Then I cut 4 inches off the remaining drink tube connected to the bite valve. To both of these section of drink tube connect one of the male ends of the HydroLink adapter. Finally attach the remaining empty drink tube end (the one that you cut off the bite valve section and attached a male adapter to) and the output on the Sawyer Squeeze. What you are left with is awesome. Replace the water pouch that comes with the Sawyer Squeeze Mini (the one that comes with it doesn’t hold much water and since the opening is so small its tough to fill – especially from still water) and you have a way to take care of easy trail water resupplies as well as filter a ton of water when you are at camp. The first lets you filter water on the trail. Fill up the Water Tank, screw the Sawyer Squeeze Mini to it, close the drink tube’s on/off valve, detach the bite valve and finally snap in the other end of the Sawyer Squeeze Mini. 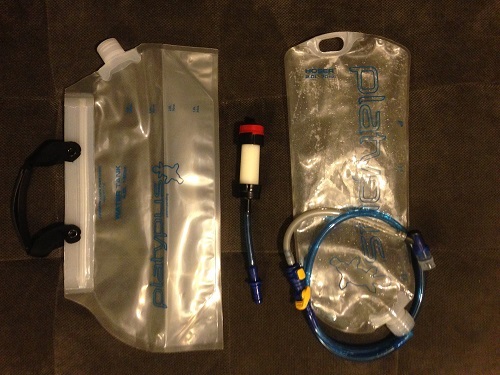 You can squeeze on the water tank to push water through the filter and into your hydration bladder. 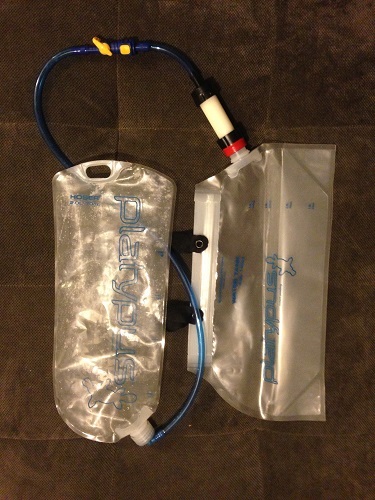 This allows you to fill your hydration bladder without taking it out of your pack. Filtering water while hiking. Side Note: every so often the Sawyer Squeeze Mini needs to be backwashed with clean water to keep it preforming its best. With this setup all you need to do is snap the filter onto the drink tube and squeeze your hydration bladder to push clean water back through the filter. You can also filter water effortlessly at camp by turning your setup into a gravity filter. 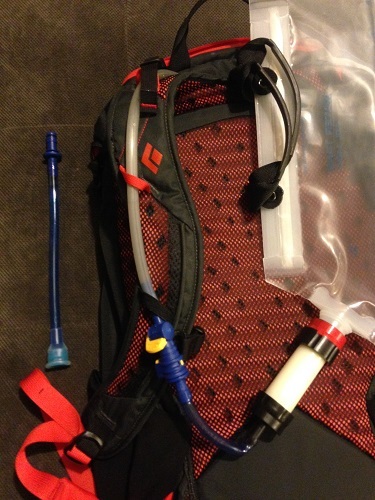 Hook it up the same way as before but take the hydration bladder out of your pack. Hang it from a tree or your tent with the Water Tank at the highest point. Gravity will push water from the Water Tank, through the filter and into your bladder. Once the bladder is full you can disconnect the Water Tank and save the remaining 2L of unfiltered water for later. 2L of water takes about 5 minutes to filter with this method. You can turn your Sawyer Squeeze Mini into a gravity filter if you hook it up like this and hang it from a tree. This isn’t the lightest way to use the Sawyer Squeeze Mini (total weight is 9.9 oz.) but for me the convenience factors completely overshadow the couple extra ounces this setup packs on. This entry was posted in Brands, Sawyer, Gear, Water Bottles, Gear, Camp Kitchen, Water Purification. Can you post a video of how you use this setup? Not sure if I’m following your description. Sure thing. I’ll be in the woods this weekend which makes it easy to document.